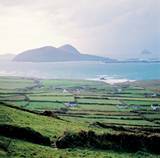 From his comfortable cottage base Peter Henshaw slowly discovers the beautiful Dingle Peninsula in south west Ireland. Fungie the celebrity dolphin was proving elusive. We'd been out in Dingle Bay for the best part of half an hour, scanning the choppy water for the sight of a fin or his smiley snout. Perhaps, being a true celebrity, he wanted to keep the camera-wielding papparazzi hungry. He apparently arrived on the south-west coast of Ireland 20 years ago, liked it, and stayed. Since then, Fungie has become one of the Dingle Peninsula's biggest tourist attractions. Boat trips out to catch a glimpse of him cost around £6 a head. So half a dozen boats were out there in the bay, each one full of camera-clicking tourists. Suddenly, someone spotted a fin, and all six boats surged towards it. Engines roared, our vessel lurched and all six boats began to converge on the same spot. I could see the headlines: "Bizarre six boat pile-up in Dingle Bay. One hundred cameras ruined. The only witness was a dolphin who couldn't stop laughing." But we hadn't come to Ireland to see dolphins. 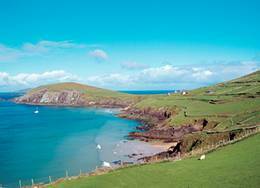 The chance of a self-catering holiday on the Dingle peninsula  as far west as you can go in Europe without getting your feet wet  was too good an opportunity to miss. Besides, I could claim some distant Irish ancestry (along with 40 million Americans, so I'm told).The promise of rugged coastline, live music and the odd pint of Guinness sealed the deal. "Are you English?" The landlady peered round the door of the B&B at us. "Then I have to explain about the Euro." Yes, if there's one thing the English are famous for these days, it's failing to understand the common currency used by almost everyone in Europe except us. Mind you, it can be confusing in Ireland, where the old Punt used to be roughly on a par with sterling. With a Euro worth about 60p, everything looks more expensive than it really is  54 Euros for bed and breakfast translated into a very reasonable £18 each for a spacious en suite double room, with breakfast. An Irish breakfast, by the way, seems much the same as an English one, but with an extra sausage thrown in. We'd just come off the Rosslare ferry, and didn't fancy attempting the 220-odd miles to our rented cottage at Dingle overnight, so followed one of the many B&B signs pointing off the main road. Taking a ferry to Ireland involves several options, and we had the choice of Swansea-Cork or Fishguard-Rosslare. We opted for the latter, with Stena Line  it involves more driving at either end, but less time on the ferry. Not that we were driving, my day job is writing for a motorcycle magazine, and we'd been lent a Suzuki Burgman 650 for the trip. This is a new breed of machine, a sort of scooter-on-steroids, which supposedly combines motorcycle performance with scooter convenience. Which it did, at 60mpg. Not that Irish roads give you much chance for speeding. It's a bit like going back to how England was 30 years ago, when the traffic was lighter and less manic, and bypasses were few. Dual carriageways are rare, motorways non-existent. And most of the drivers seem to have been to charm school, politely pulling over onto the hard shoulder to allow faster traffic to pass. It's all very nice, but come here with a motorway mindset and you'll need to allow more time for travelling. What with taking the scenic route, following the Blackwater Valley through Lismore, Fermoy and Mallow, those 220 miles took us all day. But it was worth it. This is a beautiful part of Ireland, and we passed several modest mountain ranges as we headed west. Then the land opens out and you're skimming along a narrow road with Dingle Bay on your left, mountains on the right  you can see why this area has become so dependent on tourism. Every other cottage seems to be a B&B, or café, or craft shop, but there's still a relaxed air about the place. Walking into one cottage-come-café we took a wrong turn and found ourselves in the living room, where a middle-aged man was just settling down with his newspaper. "Oh, you're all right. The tea room's through there." Rugged coastline, tea shops and tourists. This is Cornwall, without the pasties or pixies. The best way to see that coastline is to follow the Slea Head Drive, a 35-mile circular route signposted from Dingle town around the very edge of Slea Head. It's a spectacular road, narrow and twisty with sheer cliff on one side, a sheer rock face on the other. You get panoramic views of Dingle Bay and a sparkling blue open sea, which looked more Aegean than Atlantic when we were there. I'm reliably informed that the weather isn't always so kind. From here, you can take a boat trip out to the Blasket Islands (about £12 return), which is good for walking and sea bird watching. If you don't fancy driving, the Dingle Way footpath traces its way along the coast here, or you can hire a bicycle in Dingle's only cycle shop. Lots of cyclists do the Slea Head Drive (hard work, but worth it), and you get more of a feel of the place than gazing through a car window. So that's what we did, and one high point of the whole trip was freewheeling back down the coast road as dusk fell and a golden sunset filled the Atlantic horizon. We'd pedalled up to the Stonehouse Restaurant to try some of the seafood which is a speciality around here. Needless to say, most of it is locally caught, and the tempura of lemon sole, and the baked salmon on sweet potato, were both as good as they sounded. Nor did they break the bank, at £10 a head. However, Ireland has its culinary duds, just like anywhere else. A 'baked potato with cheese' in a Tralee café turned out to be a flabby skinless thing, surmounted by a processed slice of orange plastic. And this from a nation that built itself on the potato! To go with the seafood, watersports are big around here, especially on the north side of the Dingle Peninsula, reached from Dingle via the stunning Connah Pass. Windsurfing, sailing, canoeing and diving are all on offer, with or without tuition. The Dingle Tourist Office will point you in the right direction. You can book boat trips there too. If Fungie doesn't appeal, you could try deep-sea fishing, or a two-hour trip along the coast for a spot of bird and cliff watching. Inland, there's pony trekking and a choice of golf courses. But in the end, the best way to appreciate the Dingle Peninsula is to walk up Eagle Mountain, as we did on our last day. From here, you get a panoramic view of the coast, the bay and the ocean. It was hot, clear and still. Walking back down, we met a farmer and his dog, taking a rest by the side of the track. "Do you know, I've been to America, but there's no view like that in the whole world." He looked out over the bay: "Nothing compares to Dingle on a day like this."